Mr. Cage, why did you change your name? I had to reinvent myself. I am still legally Nicolas Coppola, but I am Nicolas Cage. I love my family and all of their accomplishments, but as a young actor going into casting offices I couldn’t get that off of me. I had to focus on the character and the audition and there was pressure because of my name. As soon as I went into the casting office under a new name and they didn’t know that there was a connection and I got the part, I was like, “I can really do this.” I felt liberated. It gave me the freedom to become what I wanted to be in my dreams. It’s funny that you talk about liberation when the name you chose is Cage. It is ironic, I hadn’t thought of it that way. I was looking for a name that was unique but simple. I wanted people to remember an exotic name that was short and sweet and Cage to me seemed right. Tom Cruise changed his name, we came up together, and I also liked the avant-garde composer John Cage. I thought it was interesting you had both sides, you know, you have the popcorn side and the more thoughtful side. That’s been true of your career, actually. You’ve received acclaim for your acting, even winning an Academy Award for Best Actor, but you do a lot of “popcorn” films too. Is that by design? Yes, it was by design. I wanted to break the mold a little bit. I was reading books by Stanislavsky, you know An Actor Prepares, and I was interested in the idea of opening doors for performance in film so you don’t have to get stuck in one style: naturalism, photorealism. I like to mix it up a little bit in terms of my presentation. I can be quiet and cinéma vérité and get more into the minutia of a performance, but I can also do an operatic, larger than life, jazz-acting sort of thing. 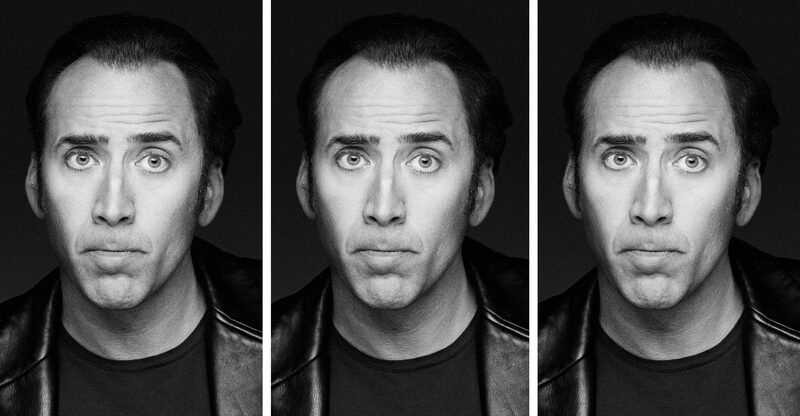 A collage of Nicolas Cage's most intense scenes. Roger Ebert once called you a fearless actor who doesn’t care if the audience thinks you are going over the top. Is that true? You can design a performance in terms of the size of it, go outside the box, be operatic, but if there is emotional content in it – if you still have the feeling – you can commit to whatever you want. I’m not the first one to do it. In the ’30s it happened quite a bit. Look at Cagney, was he real? No. Was he truthful? Yes. How do you get to that place when you are on set? I’m one of those people that when I do stunts or drink a lot of coffee it calms me down. And I like what it can offer in terms of creativity – you could feel the focus on set. You don’t have to act. If you can avoid acting and get to the truth of it and be in the moment, something magical will happen. What do you say to the people who criticize your style and call it overacting? It hasn’t always been met with appreciation, but that is the beauty of the challenge: you have to stick to your beliefs. I think that if someone does something really unique and original, chances are that it’s going to get criticized. A lot of my heroes in the past were heavily criticized for being different, like Edvard Munch and Stravinsky. These are people that broke the mold. But what if the critics are right? Sometimes you may be doing something that isn’t there – there is no honest feeling and it’s not relevant and it doesn’t work – but sometimes if you are getting criticized you may be doing something right simply by virtue of the fact that you are getting someone to think. It’s not always best to be loved. Sometimes it’s good to be hated because you have done something that got under their skin. Has that stance been difficult for you to maintain over the years? Oh yeah. I remember when I was doing Moonstruck and I wanted to talk like Jean Marais in Beauty and the Beast – (in a deep, gravelly voice) he had that accent and his voice was very gravelly – and I thought of my character in Moonstruck like a wolf who spoke with a growl. And so I was talking like that in the movie and I got a call from the director Norman Jewison and he said, “Nicolas, the dailies aren’t working.” And then I started hearing names of other actors and I thought I was going to get fired. I had to quickly drop the Jean Marais. What was the last performance you saw that got under your skin? Joaquin Phoenix in The Master. I loved him in that. I just thought it was the most original, relentless, honest, and tragic performance that I’ve seen in modern times. There is nobody else like him. I also think Aaron Johnson is excellent. I’ve been lucky to work with all these guys. They are marching to the beat of their own drummer. You also been lucky to work with many brilliant directors: the Coen Brothers, David Lynch, Werner Herzog. Was that also by design? I’ve been lucky to work with some of the most creative people and it’s true that I enjoy filmmaking and I’m an enthusiast. I’d seen Blood Simple and I really wanted to work with the Coen Brothers and I must have auditioned for Raising Arizona 10 times. Werner was a blessing because we were getting together at the time where there might have been some confusion about the roles I was choosing and he gave me a chance to get back to my roots and do independent filmmaking in a way that seemed a bit more original. Confusion about the roles you were choosing? So you are concerned with what people think of you? I just want people to get the story right: it’s by design, it’s a concept, it’s something that I want to do! It’s not because I have no control. It’s because I’m in control by being out of control.